Education, establishment of consulates, space exploration, mineral resources, railway systems and TV were among 24 intergovernmental agreements signed by India and China in Beijing. 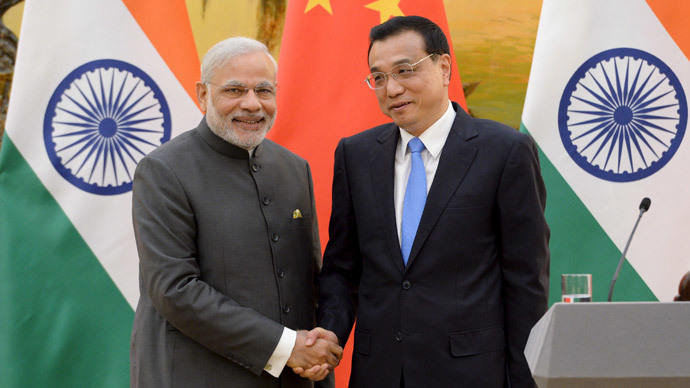 The news was announced after Modi held negotiations with Chinese Premier Li Keqiang on Friday. The meeting took place in Beijing on the second day of the PM’s three-day visit to China. "Today, we have signed over 20 agreements, covering diverse areas of cooperation. This shows the depth and maturity of our relationship and the positive direction of our partnership," said Narendra Modi in a joint press conference after the signing of the deals. Mr. Modi also said India wanted more investment from China, greater access to its markets and a shared commitment to ensure that their disagreements remain in check. China and India are disappointed in the current trade volume compared to their market and national strength. India estimates last year’s trade deficit with China at $45 billion, a third of its global trade gap. Li Keqiang said the two countries had "enough political wisdom to manage and control differences,” adding that the countries’ common interests were far bigger than the differences. Modi said that his three-day visit to China would deepen bilateral ties and create a milestone for the relations between developing countries in Asia and around the world. “21st century belongs to Asia," the PM told CCTV prior to his visit.